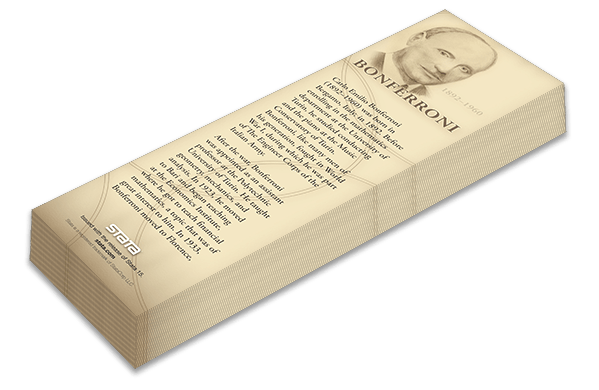 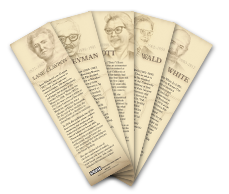 Collect the complete set of all 45 bookmarks created since we first produced series 1 with the release of Stata 10 in 2007, including the just-released series 9 bookmarks. 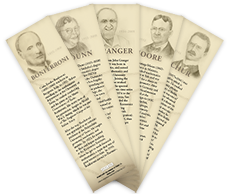 Set of 5 commemorative bookmarks documenting the accomplishments of Carlo Emilio Bonferroni, Olive Jean Dunn, Clive William John Granger, Eliakim Hastings Moore, and Issai Schur. 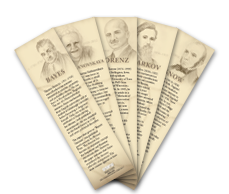 Set of 5 commemorative bookmarks documenting the accomplishments of Thomas Bayes, Vera Nikolaevna Kublanovskaya, Max Otto Lorenz, Andrey Markov, and John Snow. 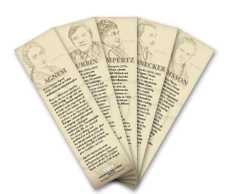 Set of 5 commemorative bookmarks documenting the accomplishments of Maria Gaetana Agnesi, James Durbin, Benjamin Gompertz, Leopold Kronecker, and Siméon-Denis Poisson. 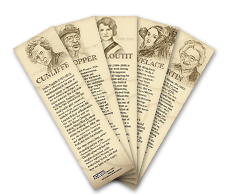 Set of 5 commemorative bookmarks documenting the accomplishments of Stella Cunliffe, Grace Murray Hopper, Isobel Loutit, Ada Lovelace, and Margaret E. Martin. 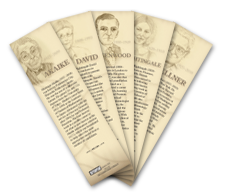 Set of 5 commemorative bookmarks documenting the accomplishments of Janet Lane-Claypon, Jerzy Neyman, Elizabeth Scott, Abraham Wald, and Halbert White, Jr.
Set of 5 commemorative bookmarks documenting the accomplishments of Hirotugu Akaike, Florence Nightingale David, Major Greenwood, Florence Nightingale, and Arnold Zellner. 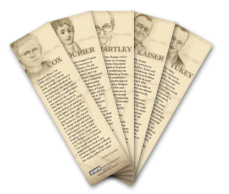 Set of 5 commemorative bookmarks documenting the accomplishments of Gertrude Mary Cox, Jean Baptiste Joseph Fourier, Herman Otto Hartley, Henry Felix Kaiser, and John Wilder Tukey. 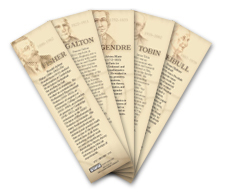 Set of 5 commemorative bookmarks documenting the accomplishments of Ronald Aylmer Fisher, Francis Galton, Adrien-Marie Legendre, James Tobin, and Ernst Hjalmar Waloddi Weibull. 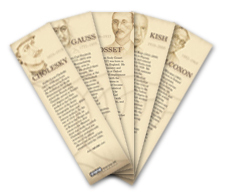 Set of 5 commemorative bookmarks documenting the accomplishments of André-Louis Cholesky, Johann Carl Friedrich Gauss, William Sealy Gosset, Leslie Kish, and Frank Wilcoxon.